Ten crews of highly trained pilots shook off the rust and were retrained for Modular Air Fire Fighting Systems or MAFFS at Peterson Air Force Base in Colorado Springs, Colo. 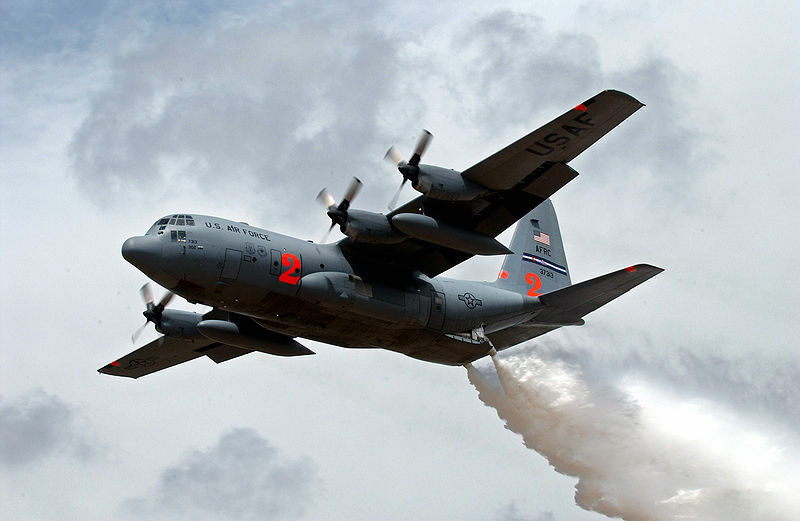 This year marks the 40th anniversary of the Lockheed C-130’s use in aerial fire fighting. The operators are volunteer air force reservists with the U.S. Air Force 302d Airlift Wing who are ready at any minute. Now their MAFFS are getting an upgrade to deliver more retardant and water to firefighters below and make reloading even easier. The MAFFS’ new valves deliver more than 3,000 gallons of water or retardant in just 5 seconds, covering more than one thousand square feet below. These drops help firefighters on the ground by circling the fire, creating containment lines faster. The upgraded equipment allows the C-130s to reload their materials at different bases around Colorado. For the complete story and video by Sam Baranowski of KXRM-TV, click here.